:30 television spot created for the Zero Addiction initiative to address prescription drug abuse in Alabama. This spot focuses on prescription opioid drug misuse. :30 television spot created for the Zero Addiction initiative to address prescription drug abuse in Alabama. This spot focuses on prescription ADHD drug misuse. 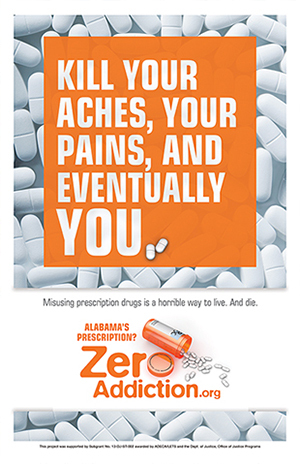 :60 radio spot created for the Zero Addiction initiative to address prescription drug abuse in Alabama. This spot focuses on prescription ADHD drug misuse. Prescription drug abuse is the nation’s fastest growing drug problem. Zero Addiction is a program sponsored by the Alabama Office of Prosecution Services to encourage families and friends to talk to anyone they know who might be addicted. Learn more about our Zero Addiction and Zero Meth campaigns. Visit http://zeroaddiction.org for more information. This project was supported by Subgrant No. 13-DJ-ST-002 awarded by ADECA/LETS and the Dept. of Justice, Office of Justice Programs. 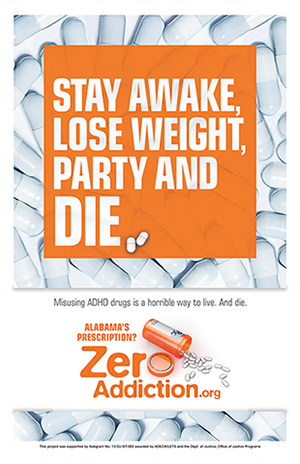 :60 radio spot created for the Zero Addiction initiative to address prescription drug abuse in Alabama. This spot focuses on prescription pain pill misuse. Prescription drug abuse is the nation’s fastest growing drug problem. Zero Addiction is a program sponsored by the Alabama Office of Prosecution Services to encourage families and friends to talk to anyone they know who might be addicted. Learn more about our Zero Addiction and Zero Meth campaigns. Visit http://zeroaddiction.org for more information. This project was supported by Subgrant No. 13-DJ-ST-002 awarded by ADECA/LETS and the Dept. of Justice, Office of Justice Programs. Known by a variety of street names, synthetic drugs contain plant material sprayed with synthetic psychoactive chemicals. A mixture that can be addictive — and deadly.